Figure 7. 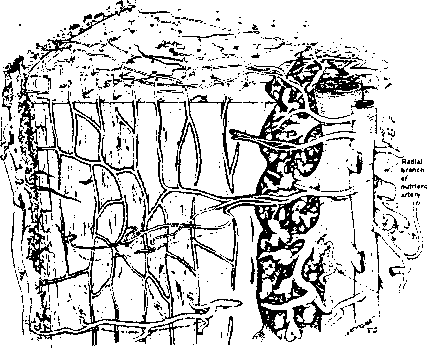 The capillary network within cortical bone. The major arterial supply to the diaphysis is from the nutrient artery. There is an abundant capillary bed throughout the bone tissue that drains outwards to the periosteal veins. Modified from Figure 4 of E.A. Williams, R. H. Fitzgerald, and P.J. Kelly, "Microcirculation of Bone," in The physiology and pharmacology of the microcirculation, Vol. 2, Academic Press, (1984). The major share of the venous blood leaving long bones has been shown by phlebography to travel by this route . The abundantly anastomosing periosteal network of veins is considered by some workers to drain the diaphyseal bone cortex completely under normal conditions . Many of the veins leaving the long bone pass through muscles, in particular the calf muscle in the case of the lower limb. The alternate contraction and release of the muscles containing the veins is effectively a pump returning the blood towards the heart and away from the bone and decreasing the IMP. The IMP can be reduced by exercise of the muscles of the calf. This arrangement in the case of the calf muscles is illustrated in figure 8. It is clear that the long bone as a whole has multiple venous pathways, the relative importance of which can vary with time and circumstance. Figure 8. 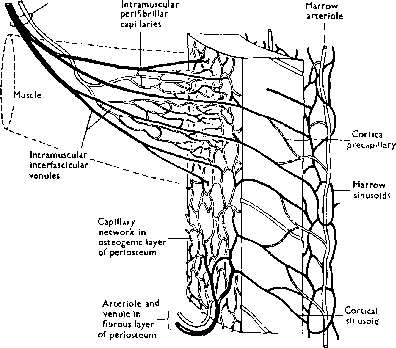 The vascular connection between bone marrow, cortex, periosteum and attached muscle. From Fig. 9.37 of M. Brooks and WJ. Revell, Blood Supply of Bone, Springer, London, (1998). The existence of lymphatic vessels in bone remains unclear. On physiologic evidence, some sort of lymph circulation must be present. Large molecules, such as albumin (mol wt 68,000) and horseradish peroxidase (mol wt 40,000), have been shown to leak out of bone capillaries into the interstitial fluid [17,49], and they must have a pathway to return to the general circulation. Kolodny  demonstrated that two weeks after India ink was injected into the medullary cavity of long bones, carbon particles were found in the regional lymph nodes. However, attempts to demonstrate discrete lymphatic vessels within marrow and bone tissue have been consistently unsuccessful. It has been shown with injection studies using thorotrast  that this substance leaks from the capillaries of cortical bone into the perivascular fluid and that eventually it can be seen in the periosteal lymphatic vessels. A similar finding has been observed in cortical bone after the use of India ink . The indirect conclusion seems to be that, although there are no demonstrable lymphatic channels in bone tissue, the perivascular fluid as a whole circulates toward the periphery of the bone, carrying with it substances such as large proteins and carbon particles to be taken up by the lymphatics of the periosteum. Anderson  noted that high arterial pressure in the bone marrow probably correlates with an absence of lymphatics in bone marrow and cortex. The development of an interactive, dynamically graphical, computational model of blood and interstitial flow in living bone tissue is advocated here. Such a model will have many significant clinical, research and educational applications. Mechanical loading, BP, IMP, venous ligation, venous pooling and surrounding muscle activity and many chemically driven processes influence the physiologically significant fluid movements in long bones. The dependence of these fluid movements on so many factors makes it very difficult for one to comprehend any particular fluid movement. The following quote from the work  of Albert Harris, a biologist, describes the situation: "Systems of interacting forces and stimuli don't have to be very complicated before the unaided human intuition can no longer predict accurately what the net result should be. At this point computer simulations, or other mathematical models, become necessary. Without the aid of mechanicians, and others skilled in simulation and modeling, developmental biology will remain a prisoner of our inadequate and conflicting physical intuitions and metaphors." There are changes in the blood supply to a long bone due to ageing, surgery and injury. The changeover with age from a medullaiy to a periosteal blood supply to bone cortex is the consequence of medullary ischemia and reduced marrow arterial pressure, brought about by medullary arteriosclerosis. In section 4.3 on transcortical arterial hemodynamics it was noted that Bridgeman and Brookes  have shown that aged bone cortex is supplied predominantly from the periosteum in contrast to the medullary supply in young human and animal material. They argue that this change is attributed to increasingly severe medullary ischemia with age, brought on by arteriosclerosis of the marrow vessels. It is clear that if the medullary circulation has not been compromised by age, it will be compromised by an implant that occupies the medullary canal. A desirable property of the proposed model will be to predict these changes. Mechanical loading of the bone can transiently increase the IMP. A desirable property of the proposed model will be to predict these mechanical loading induced changes. The IMP can also be increased by application of venous ligature [41-48]. A desirable property of the proposed model will be to predict the IMP increase due to venous ligature. The IMP can be reduced by exercise of the muscles of the calf. A desirable property of the proposed model will be to predict the IMP reduction due to the exercise of the calf muscles. The IMP is influenced by the large venous pooling capacity, 6 to 8 times the arterial volume. The pooling capacity raises the possibility of vessel collapse and ischemia. A desirable property of the proposed model will be to predict influence of the large venous pooling capacity in bone. The contents of the medullary canal is a porous cylinder enclosing globular porous sinusoids, distended fat cells, gel-like extracellular matrices, and a variety of blood components from platelets to neutrophils in various stages of maturity, all of which form a viscoelastic composite. The IMP in the diaphysis is greater than that in the metaphysis or the epiphysis. The IMP is difficult to measure, as was noted in section 2.3 above on the fluid pressures in long bones. Ischemia is the term used to describe the insufficient blood supply to a tissue or organ. It is particularly pronounced in bones. Atherosclerosis or arteriosclerosis is a degenerative process that affects most blood vessels in most people (in varying degrees) and begins in early teens. 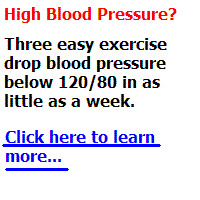 Its progression is related in part to genetics, diet, smoking, and high blood pressure. It can be exacerbated by injuries such as trauma or surgery; it causes narrowing and irregular surfaces in blood. 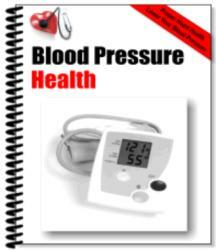 It is the most frequent problem in arteries. This degenerative process occurs about 10 years earlier within the bone than elsewhere in the body. Osteoarthritis is a chronic disorder of a joint with excessive erosion of the cartilage surface associated with excess bone formation at the margins of the joint and gradual loss of function because of pain and stiffness. This may be the outcome of abnormal mechanical forces, such as prior injury, or a systemic disorder, such as rheumatoid arthritis or gout. There is evidence that a deficiency in venous drainage of joint structures may be associated with osteoarthritis . The placement of an implant in bone obviously changes the pattern of blood circulation. When the implant occupies a significant portion of the medullary canal, it can destroy the medullary circulation  and require a conversion of the main supply to the bone cortex to come from the periosteum rather than the nutrient artery. Otter et al. describe a hypothesis that bone perfusion/reperfusion initiates bone remodeling and the stress fracture syndrome. Recall that stress fractures have been proposed to arise from repetitive activity of training inducing an accumulation of micro-fractures in locations of peak strain. However, Otter et al. note that stress fractures most often occur long before accumulation of material damage could occur; they occur in cortical locations of low, not high, strain, and intracortical osteopenia precedes any evidence of microcracks. They propose that this lesion arises from a focal remodeling response to site-specific changes in bone perfusion during redundant axial loading of appendicular bones. They note that IMP's significantly exceeding peak arterial pressure are generated by strenuous exercise and, if the exercise is maintained, the bone tissue can suffer from ischemia caused by reduced blood flow into the medullary canal and hence to the inner two-thirds of the cortex. Site specificity is caused by the lack, in certain regions of the cortex, of compensating matrix-consolidation-driven fluid flow that brings nutrients from the periosteal surface to portions of the cortex. Upon cessation of the exercise, re-flow of fresh blood into the vasculature leads to reperfusion injury, causing an extended no-flow or reduced flow to that portion of the bone most strongly denied perfusion during the exercise. This leads to a cell-stress-initiated remodeling which ultimately weakens the bone, predisposing it to fracture. The testing of this hypothesis could be done with the proposed model. The research applications of the proposed model are numerous: for example, the prediction of the redistribution of blood supply, the prediction of the IMP, the ISFP due to changes in mechanical loading, BP, venous ligation, venous pooling and surrounding muscle activity. The model can be used to aid in the discovery of the nature of bone lymphatics and bone innervations. It was pointed out in section 8 above that the existence of lymphatic vessels in bone remains unclear. On the basis of physiologic evidence there must be some sort of lymph circulation present in bone, but how the circulation is accomplished is a mystery. With respect to bone innervation, it is known from dissections that numerous nerve fibers accompany the afferent vessels in bone, and that many nerve fibers in bone marrow are sensible to painful stimuli including distension. If the proposed model were specialized for various animals, for example the rat and the canine as well as the human, then a basis for converting experimental data determined from the rat and the canine to the human could be established. The educational ability of the proposed model is somewhat proportional to the effectiveness of the graphical representations of the computationally predicted evolution of the biological processes and the "user friendliness" of the input control process. Assuming that these are both done well, then one can foresee the model being used to train and educate surgeons and to educate biologists and biomechanical engineers. NIH, NSF and the PSC-CUNY Research Award Program of the City University of New York supported this work. 1. Weinbaum S., Cowin S.C. and Yu Zeng, A model for the fluid shear stress excitation of membrane ion channels in osteocytic processes due to bone strain, hi Advances in Bioengineering ed. by R. Vanderby Jr., Am. Soc. Mech. Engrs. New York (1991) p. 718, & Weinbaum S., Cowin S.C., and Yu Zeng, A model for the excitation of osteocytes by mechanical loading-induced bone fluid shear stresses, J. Biomechanics 27 (1994) pp. 339-360. 2. Cowin S., Weinbaum S. and Yu Zeng, A case for bone canaliculi as the anatomical site of strain-generated potentials, J. Biomechanics 28 (1995) pp. 1281-1296. 3. Cowin S.C. and Moss M.L., Mechanosensory mechanisms in bone, In Textbook of Tissue Engineering ed. by R. Lanza, R. Langer, and W. Chick, (2nd edition),( Academic Press, San Diego 2000) pp. 723-738. 4. Biot M.A., Le problème de la consolidation des matières argileuses sous une charge, Ann. Soc. Sci. Bruxelles B55 (1935) pp.110-113. 5. Biot M.A., General theory of three-dimensional consolidation, J. Appl. Phys. 12 (1941) pp.155-164. 6. Cowin S.C., Bone Poroelasticity, J. Biomechanics 32 (1999) pp. 218-238. 7. Morris M.A., Lopez-Curato J.A., Hughes S.P.F., An K.N., Bassingthwaighte J.B., and Kelly P.J., Fluid spaces in canine bone and marrow, Microvascular Res. 23(1982) pp. 188-200. 8. Neuman W.F., Toribara T.Y., and Mulrvan B.J., The Surface Chemistiy of Bone. VII The Hydration Shell (1953). 9. Neuman W.F., and Neuman M.W., The Chemical Dynamics of Bone, (University of Chicago Press, Chicago, 1958). 10. James J., Steijn-Myagkaya GL, Death of osteorytes: Electron microsrcopy after in vitro ischaemia, J. Bone Jt. Surg. 68B (1986) pp. 620-624. 11. Catto M., Pathology of aseptic bone necrosis, In Aseptic Necrosis of Bone ed. by J.K.Davidson (American Elsevier 2, New York, 1976). 12. Seliger W.G., Tissue fluid movement in compact bone, Anat. Rec. 166(2) (1970) pp. 247-255. 13. Dillaman R.M., Movement of Ferritin in the 2 Day-Old Chick Femur, Anat. Rec. 209 (1984) pp. 445-453. 14. Tanaka T., and Sakano A., Differences in permeability of microperoxidase and horseradish peroxidase into the alveolar bone of developing rats, J Dent Res. 64 (1985) pp. 870-876. 15. Li G., Bronk J.T., An K.N., and Kelly P.J., Permeability of cortical bone of canine tibiae, Microcirculation Res. 34 (1987) pp. 302-310. 17. Doty S.D., and Schofield B.H., Metabolic and structural changes within osteocytes of rat bone, In Calcium, Parathyroid Hormone and the Calcitonins ed. by Talmage and Munson, eds., (Excerpta Medica, Amsterdam, 1972) pp. 353-364. 18. Doty S.D., Private communication, (1997). 19. Tate M.L., Niederer P., Knothe, Knothe U., In vivo tracer transport through the lacunocanalicular system of rat bone in an environment devoid of mechanical loading, Bone 22 (1998) pp.107-117. 20. Azuma H., Intraosseous pressure as a measure of hemodynamic changes in bone marrow, Angiology 15 (1964) pp. 396-406. 21. Shim S., Hawk H., and Yu W., The Relationship between blood flow and marrow cavity pressure of bone, Surgery, Gynecology and Obstetrics 135 (1972) pp. 353-360. 22. Wang L., Fritton S.P., Cowin S.C. and Weinbaum S., Fluid pressure relaxation mechanisms in osteonal bone specimens: modeling of an oscillatory bending experiment, J. Biomechanics 32 (1999) pp. 663-672. 23. Yoffey J.M., Hudson G., Osmond D.G., The lymphocyte in guinea-pig bone marrow, J. Anat. 99 (1965) pp. 841-860. 24. Rhinelander F.W. and Wilson J.W., Blood supply to developing, mature and healing bone. In Bone in Clinical Orthopaedics ed. by G. Summer-Smith (W. B. Saunders, Philadelphia 1982) pp. 81-158. 25. Doty S.B., Morphological evidence of gap junctions between bone cells, Calcif. Tissue Int. 33 (1981) pp. 509-512. 26. Kornblum S.S., The microradiographic morphology of bone from ischaemic limbs, Graduate thesis, University of Minnesota (1962). 28. Martin G.R., Firschein H.E., Mulryan B.J., and Neuman W.F., Concerning the mechanisms of action of parathyroid hormone. II. Metabolic effects, J. Am. Chem. Soc. 80 (1958) pp. 6201-6204. 29. Neuman M.W., Bone Blood Equilibrium, Cal. Tissue Int. 34 (1982) pp. 117120. 30. Bridgeman G.and Brookes M., Blood supply to the human femoral diaphysis in youth and senescence, J. Anat. 188 (1996) pp. 611-621. 31. De Bruyn P.P.H., Breen P.C., Thomas T.B., The microcirculation of the bone marrow, Anat. Ree. 168 (1970) pp. 55-68. 32. Lopez-Curto J.A., Bassingthwaighte J.B., Kelly P.J., Anatomy of the microvasculature of the tibial diaphysis of the adult dog, J.Bone Joint Sur. 62 (1980) pp. 1362-1369. 33. T'rueta J. and Harrison M.H.M., The normal vascular anatomy of the femoral head in the adult man, J. Bone Joint Surg. 35B (1953) 442-461. 34. Zamboni L. and Pease D.C., The vascular bed of red bone marrow, J. Ultrastruct Res. 5 (1961) pp. 65-73. 35. Branemark P.-I., Angiology 12 (1961) pp. 293-305. 36. Nelson G.E. Jr., Kelly P.J., Peterson L.F.A., Janes J.M., Blood supply of the human tibia, J.Bone Joint Surg. 42A (1960) pp. 625-636. 37. Cooper R.R., Milgram J.W., Robinson R.A., Morphology of the osteon: an electron microscopy study, J.Bone Joint Surg. 48A (1966) pp. 1239-1271. 38. Hughes S. and Blount M., The structure of capillaries in cortical bone, Ann. R. Coll. Surg. Engl. 61 (1979) pp. 312-315. 39. Cuthbertson E.M., Siris E., and Gilfillan R.S., The Femoral Diaphyseal Medullary Venous System As A Venous Collateral Channel In The Dog, J. Bone Joint Surg. Am. 47 (1965) pp. 965-974. 40. Brooks M. and Revell W.J., Bloods Supply of Bone (Springer, London 1998). 41. Kelly P. J.and Bronk J.T., Venous pressure and bone formation, Microvasc. Res. 39 (1990) pp. 364-375. 42. Welch R.D., Johnston,2nd C.E., Waldron M.J., Poteet B., Bone changes associated with intraosseous hypertension in the caprine tibia, J Bone Joint Surg. Am. 75 (1993) pp. 53-60. 43. Bergula A.P., Huang W., Frangos J.A., Femoral vein ligation increases bone mass in the hindlimb suspended rat, Bone 24 (1999) pp. 171-177. 44. Lilly A.D. and Kelly P. J., Effects of venous ligation on bone remodeling in the canine tibia, J Bone Joint Surg. Am 52 (1970) pp. 515-520. 45. Arnoldi C.C., Lemperg R., Linderholm H., Immediate effect of osteotomy on the intramedullary pressure in the femoral head and neck in patients with degenerative osteoarthritis, Acta Orthop. Scand. 42 (1971) pp. 454-455. 46. Green N.E. and Griffin P.P., Intra-osseous venous pressure in Legg-Perthes disease, J Bone Joint Surg. Am. 64 (1982) pp. 666-671. 47. Liu S.L. and Ho T.C. , The role of venous hypertension in the pathogenesis of Legg-Perthes disease. A clinical and experimental study, J Bone Joint Surg. Am. 73 (1991) pp. 194-200. 48. Wang L., Fritton S.P., Weinbaum S., Cowin S.C., On bone adaptation due to venous stasis, J. Biomechanics 36 (2003) pp. 1439-1451. 49. Owen M.and Triffitt J.T., Extravascular albumin in bone tissue, J. Physiol. 257 (1976) pp. 293-307. 50. Kolodny A., Arch. Surg (Chicago) 11 (1925) pp. 690-707. 51. Harris A.K., Multicellular mechanics in the creation of anatomical structures. In Biomechanics of Active Movement and Division of Cells, ed. by N. Akkas, (Springer Verlag 1994) pp. 87-129. 52. Anderson D.W., Studies of the lymphatic pathways of bone and bone marrow, J. Bone Joint Surg., 42A (1960) pp. 716-717. 53. Williams E.A., Fitzgerald R. H., and Kelly P.J., Microcirculation of Bone. In The physiology and pharmacology of the microcirculation, Vol. 2, (Academic Press 1984). 54. Otter M.W., Qin Y.X., Rubin C.T., McLeod K.J., Does bone perfusion/reperfusion initiate bone remodeling and the stress fracture syndrome?, Medical Hypotheses 53(5) (1999) pp.363-368. Which of the vessels supply the periosteum? What does the periosteum connect to? Does the periosteum cover the whole bone? How is the bone marrow supplied blood?